Summer LANGUAGE! Teacher Training from Read Kauai! Literacy programs specializing in multisensory techniques. Come and join us and have an EDUCATION VACATION on Kauai! Both instructors for this Education Vacation summer course have Master�s Degrees in Education and Curriculum. Elizabeth Scamahorn is a private consultant specializing in literacy. In addition to being a trainer for LANGUAGE!, she is also Orton Gillingham, Slingerland and �Schools Attuned� trained. 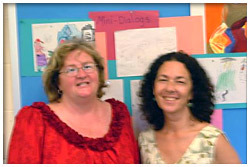 Ms. Scamahorn trains teachers in Hawaii and across the United States. Elizabeth is a member and present board member of the Hawaii International Dyslexia Association. Along with her private practice, Ms. Scamahorn teaches at Island School and is a fulltime resident of Kauai. Cory Balsom is a Literacy Consultant and teacher. She has taught students at the junior high, high school and college level for twenty five years. She has taught school in Sacramento, San Diego and the San Joaquin Valley of California. Cory is Sheltered Instruction Observation Protocol (SIOP) trained and has worked with many English language teachers. In Central California she was on staff in a high school district of fifteen schools as the Literacy Coordinator. As a Literacy Consultant, Cory has worked with teachers and administrators in Pennsylvania, New York, Georgia, Arizona and California. Cory holds BA degrees in Journalism and Theatre Arts and has a Master�s Degree in Curriculum and Instruction. She has training in LIPs, Visualizing and Verbalizing, as well as Seeing Stars all from Lindamood-Bell. She is a trainer for Sopris West/Cambium Publishers. Summertime finds her in her favorite place - Hawaii, teaching teachers. This literacy training course is available on Kauai every summer and requested dates are available for small groups throughout the year. Using the scientific research based curriculum LANGUAGE! by Dr. Jane Fell Green for instruction to elementary, middle and high school teachers from around the nation is scheduled for Kaua�i. The LANGUAGE! Curriculum involves the foundations of reading, writing, thinking, speaking and listening with the intellectual nature of the students. Teachers are given instruction in the multiple steps from sounds to text reading and expository writing. All of the elements of linguistics (phonemic awareness and phonics, word recognition and spelling, vocabulary and morphology, grammar and usage, listening and reading comprehension) are taught independently and concurrently. Information in the course comes from linguistics, fluency research, current brain studies, comprehension studies, and strong spelling practices. It is supported by such notables as Dr. Susana Dutro, Ron Yoshimoto, M.S.W. M.Ed., Drs. Sally and Bennett Shaywitz and Dr. Louisa Moats. The course provides assistance for teachers dealing with differentiation of instruction for diverse populations of students such as the English language learner, special needs/special education child and curriculum casualty students who are two or more years below their current grade level in literacy. Teachers receive knowledge and training in the structure and function of the English language in order to enhance teacher�s literacy effectiveness in the classroom. LANGUAGE! is currently a perfect solution for the third tier RTI (Response to Intervention). LANGUAGE! is presently taught in 44 states with repeated evidence of success and when taught with consistency is raising school site and district scores. Educators can agree that their success depends on continued professional growth. The climate in our schools surrounding literacy and the ever-increasing challenges we face with today�s youth require new strategies, excellent training, and access to a proven curriculum presented by instructors who can provide clear direction.